The Why of It All: It all started a long time ago -- 1,888 years by my calculation. 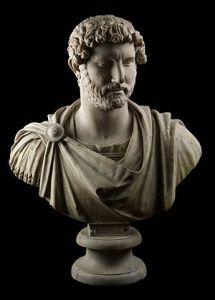 Hadrian, Emperor of the Roman Empire declared that a wall would be built to guard the northern border of the northernmost place in the empire -- far-off Britannia. 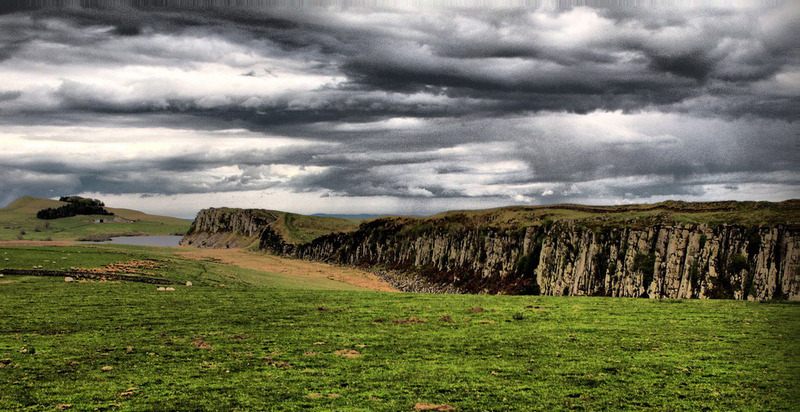 Thus, over the next six years the 2nd, 6th and 20th legions of the Roman army built a stone wall, mostly stone anyway, across the width of the island stretching from the Tyne river at the fort Segendum to the shore of Solway Firth at the fort Maia. One estimate says that 25 million facing stones somewhat larger (and much heavier) than regulation modern concrete building blocks were quarried, transported and set. The wall was bordered north and south by major earthworks. 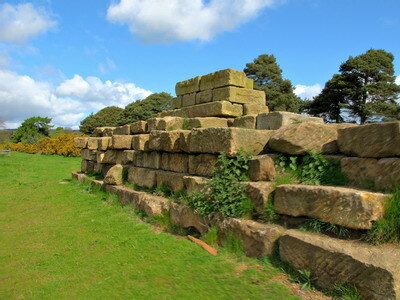 Every Roman mile along the wall there was a milecastle and between each milecastle and the next were two turrets for observation. To the south of the wall there were forts and a military road. Such construction would be arduous today; in Roman times it seems that it must have been nearly impossible. A bit of this history got through to me when I was in school and kindled an interest in ancient times. 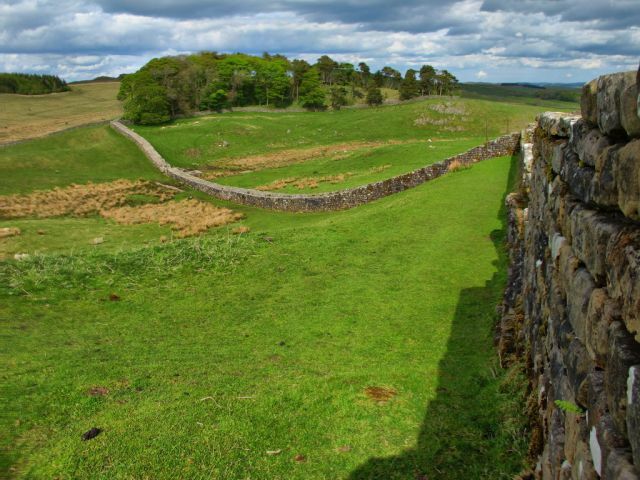 Thus, when I discovered that the Hadrian's Wall path had been created following the course of the wall, a mad idea of walking across England entered my mind. A trip like this is something that doesn't happen without planning and planning is something which has rarely entered in my travels. Thus, I was fortunate to find a company in England which does just this sort of thing -- arranging walking and cycling tours. Mickledore Travel is their name and I can't recommend them highly enough. They did a great job of scheduling my walk, arranging for lodging, meals in the more remote parts of the path, and even transporting luggage between stops. This latter task is important when one gets to my age and is unused to long-distance walking -- the difference between carrying a simple day pack and a 40-pound backpack is major and the minimal additional cost for this service is worth every cent. My plan was to have Mickledore arrange nine nights of lodging between which I would have eight days of walking. 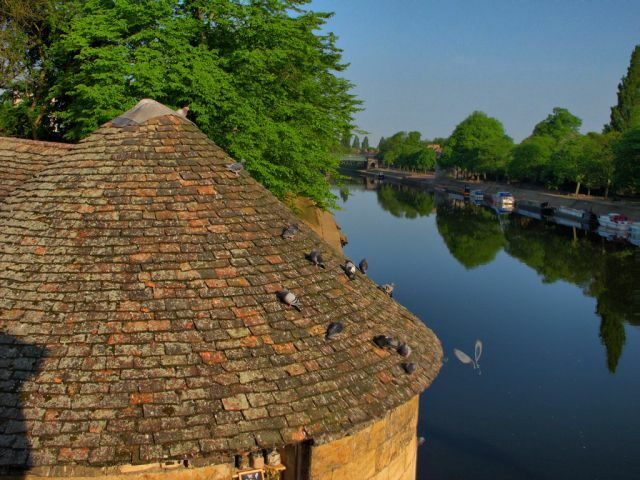 After the official walk I would have an extra day to spend in York, probably the preeminent historical city in England's north country. Flying into and out of Manchester and then using the rail system proved to be the best choice I could have made. 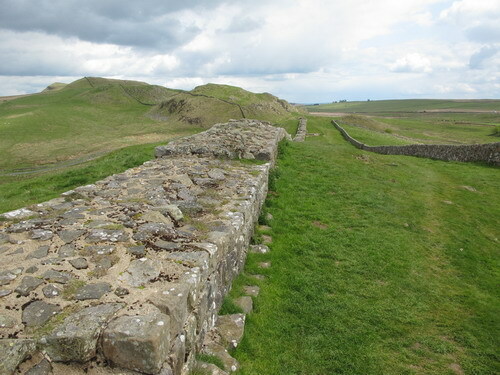 The stated length of the Hadrian's Wall Path is 84 miles and adding in the various side trips (including getting lost which I freely admit I did) put my total easily above the 100-mile mark. ↑ ↓ My flight from Knoxville was scheduled for 7:30PM but the friend that took me to the airport got me there quite early, 5:45PM. This proved to be useful since my recent airline travel experience is nil. In fact since retiring in Alaska I hadn't been on an aircraft even once -- quite the change from my working years when I seemed to be flying at least every other month for one reason or another. And the changes in security (well that is what they call it) seem designed to make the previously-simple act of checking in and boarding into a major endurance event. The short hop to Atlanta took very little time in a little regional jet, uncomfortable but endurable given the short duration. The flight from Atlanta to Manchester was not quite so endurable. The seating was, if anything, even worse, and the aircraft had zero empty seats. In other words, it was like some cattle car. And given that my seat was capable of reclining about 2 inches and I was on the aisle close to the rear restroom there was no rest to be had even after putting in my foam earplugs and popping a pill. This was during a period of flight uncertainty caused by a volcano spewing ash in Iceland which intermittently grounded or rerouted a great many flights. Guess I shouldn't complain quite so vehemently -- I could have been sitting on the ground clutching my non-refundable ticket. ↑ ↓ After the hours of the flight and five hours of timezone correction, my flight made it into Manchester at around 9:10AM. After convincing the UK authorities that I came in peace it was time to move on. 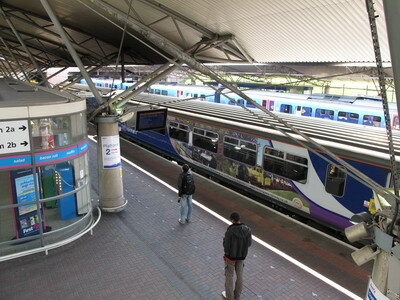 Manchester has something which every airport should have and few do -- a connection to the national rail network. This makes travel virtually anywhere in the UK really simple -- land in an airplane, ride the moving walkways and escalators, buy a ticket at the booth, and get on the train. This took less than 30 minutes in my case. The train to Newcastle upon Tyne cost a grand total of £55 (roughly $85 at the then-current exchange rate) and left right on time at 11:05AM. This was very reasonable in my estimation. This was my first time in England and thus my first time on an English train. I've read some horror stories about rail travel in the UK but my experiences were all pleasant. If only the US had a system a tenth as good as the Brits! After arriving in Newcastle I still had a bit further to go to find my first-night's lodgings at Tynemouth on the North Sea coast. This meant a walk from the train terminal and a short trip on the Tyne and Wear Metro. I finally made it to my lodging at No. 61 on Front Street at 3:10PM a bit bedraggled but eager to set off on the walk. My room at the B&B was up at the highest level of the old house but offered a splendid view across the rooftops from a huge dormer window on Front Street. Since I was settled fairly early there was plenty of time to wander around Tynemouth and snap a load of pictures. 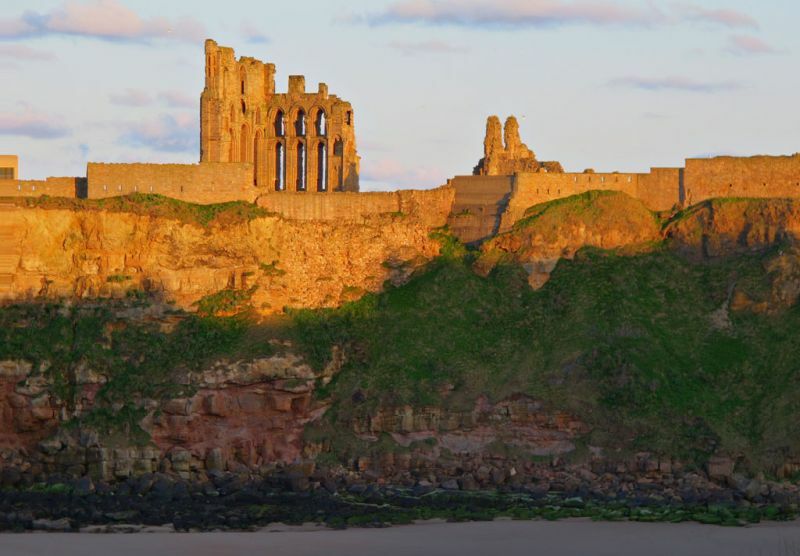 Unfortunately I was too late to do more than look at the Tynemouth Castle and Priory from the outside. Tourist sites run by English Heritage have rather short hours and there is no use in entering a site just before they slam the doors at 5:00PM (sharp!) I did manage to get a few pictures of the castle and took a rather good one of the remains of the Priory from across the water as the sun got low in the sky. I wandered the city for a few hours and saw my first cricket game (incomprehensible). Appetite failed me that evening (a most unusual circumstance), probably due to the time shifting, but I managed to eat a bit of fish and chips from the takeout across the street, got a shower and settled in for the night. Tomorrow the real trip would begin. ↑ ↓ I made an early start to the day. Too early really, given my jet-lagged metabolism, but nature would not be denied. 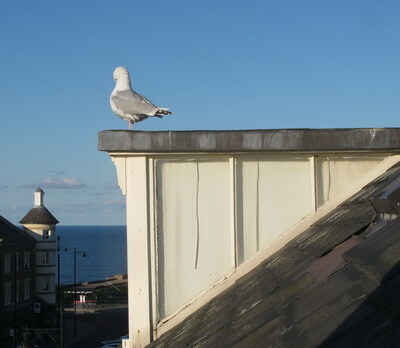 Nature in this case was a lovelorn seagull perched on the dormer peak next to mine. I don't know if he (or was it she?) attracted a mate but the squawking could certainly be heard for miles. Wide awake at 5:27AM oh well, I might as well make the best of it before the sun gets too much higher and have a wander around town for more pictures before breakfast time. I wandered from 6:00 to 7:20AM but it was still too early for breakfast so I found my way back to the Metro station to buy my ticket from the vending machine. All this walking set my nose to running, a common problem for me, so I made an early stop at the Co-operative food store for a box of tissues and a bottle of "Feel Good" orange and mango juice -- great stuff but wildly expensive. Had a typical English breakfast at the B&B although I had the sense to ask them to reduce the volume of food since I don't handle huge breakfasts well under normal circumstances and my body still had some time adjusting to do. The B&B provided me with a small packed lunch which went into my daypack. My larger bit of luggage went in the hall downstairs for pickup and transport to the next lodgings. While I'm on the subject of packs and luggage, I can recommend the kit that I bought before the trip. It is made by High Sierra. Their description calls it a 22-inch carry-on wheeled backpack with removable daypack. It can be used as normal carry-on luggage or as wheeled luggage or as a large pack or as a bag and a daypack. 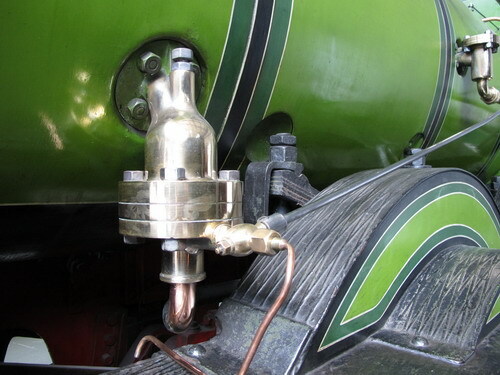 A clever bit of design and it seems to be robustly built. It certainly served me well on this trip and was well worth the price. Back onto the Metro with my daypack, jacket, and camera bound for the actual start of the Hadrian's Wall Path at Segedunum in Wallsend. On the train I accidentally met up with a couple of American women (K. and T.) who were setting out on the same walk after walking in the Cotswolds the previous week. We more-or-less fell into walking together as we ventured across the town following vague directions toward the fort. Of course we finally made it (or I'd not be writing this) and I was glad to let them do the navigating since they seemed to have more of a clue than I did. I learned that their navigational instincts were better than mine since I never quite got lost once in their company. At Segedunum we all got our Hadrian's Wall Passports and had them stamped. 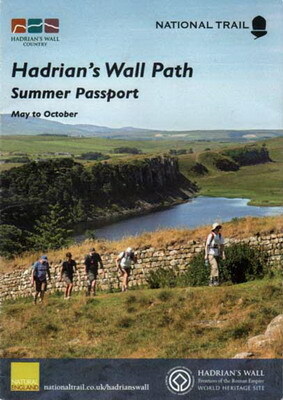 The passport is a little folding document which walkers have stamped along the path at seven locations. After the stamps are earned one can obtain a certificate (suitable for framing) showing that the walk had been completed. No mental certification is required. The beginning of the path is right on the Tyne and takes walkers through some fairly gritty areas of Newcastle which has no shortage of such in the older industrial grounds. 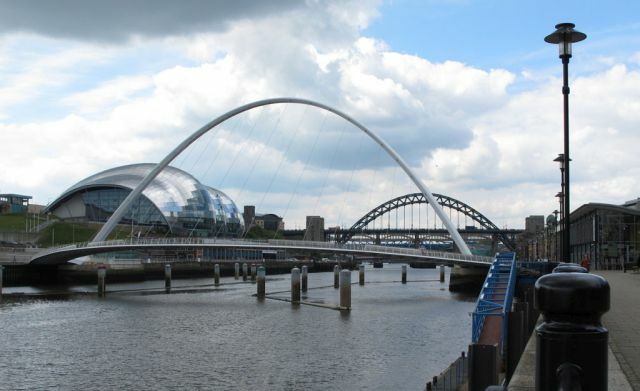 Of course there was also the river walk through the touristy areas of the city which had some attractive sights including the Gateshead Millennium Bridge. Sadly the tilt bridge did no tilting while we were there but the structure itself was attractive even while stationary. There were other areas along the way that I would have liked to see but on balance it seemed like a better idea to stay in a group. Left to my own devices I might have wandered around town all day taking pictures and visiting pubs and then wondered why I was no closer to the night's lodgings as the sun set. We found a place out of the wind in front of a large office building on the river and broke for lunch at around noon. While sitting we met a group of senior citizens who walked past as we were eating. I guess that there were eight or ten of them and none of them were less than ten years my senior. Clearly inveterate walkers they said that their aim was to walk the wall in six days (as opposed to my eight). We ran into them again as it seems that they stopped at every pub and teahouse along the way. We found them sitting in the pub at our evening stop and they said that their first stop was some miles ahead. They were never seen again so I suppose that they really did walk through. Lodgings on this night were at the Keelman's Lodge which for mailing purposes is still in Newcastle but the walking mileage for the first day was around 11 if my calculations are correct. A real plus on this evening: Keelman's is attached to the Big Lamp Brewery and the pub serves their excellent products. Dinner that night was hearty and of excellent quality. My room was in a new annex which was outstanding but K. and T. were in an older building and they said that their room wasn't as comfortable. No matter where one slept there was still the brewery to be considered. ↑ ↓ Had a nice conservative English breakfast -- eggs, bacon, toast, tea but avoided all of the additional things that might be included in a "full English". It was certainly enough. I could probably have done with another pint of their excellent ale but before 8AM that wasn't practical and if I wanted to walk a straight line it would be best to avoid strong drink before the afternoon. I walked with K. and T. again. Pleasant enough morning starting out following the Tyne for a while before cutting off toward the north and the village of Heddon-on-the-Wall which is, ta-daa, on the wall. Actually the wall in the eastern part of the village is the first major part of the wall on the walk. The village itself is drop-dead gorgeous and I suspect that it is populated mostly by commuters from Newcastle. The stone and slate architecture which I'll soon learn is endemic in rural Northumbria and Cumbria is wonderfully appealing. Even the newer homes have the appearance of having been there for a while and look as though they'll be standing centuries from now. There were a couple of homes on the way into the village from the south that looked as if they would be more comfortable standing somewhere else -- California perhaps. Very nice homes in their own way but not consonant with the whole village ambience. Leaving the village, the path followed the Military Road (B6318) which follows the course of the wall, overrunning it in places. This was not the ancient Roman Military Way but was built during in the 1740s during a Jacobite uprising to the north. Large parts of the wall were destroyed for materials in the building of the road. But this was not the first, nor probably the last, time that the wall was subjected to such indignities. They really started soon after the Roman withdrawal from Britannia in the early 5th century as the homeland came under increasing pressure from the European tribes which eventually overran and sacked the city. My reading of history tells me that there was no serious local pressure for the Romans to depart so hurriedly, just a gradual weakening and diffusion of Rome's power which made the maintenance of such a far-flung territory impossible. In any case with the departure of the Legions and effective oversight the wall became a convenient source of free building material neatly distributed across the width of the country and it was disassembled at will and became components of homes, barns, castles, and churches. It is no coincidence that the most intact parts of the wall are in the least accessible and settled areas. The walk continued past the unexcavated fort Vindobala (Rudchester). The sky to the west was looking less and less welcoming although the weather was rain-free. K., T., and I stopped at a convenient picnic table beside the "Great Northern Lake" which is a combination reservoir and bird sanctuary. This was the first run in with hordes of mosquitos. We were sitting there eating and the insects seemed to sense that they deserved to eat also. As someone who has survived Alaskan mosquitoes I can say that these were merely annoying. A couple of walkers arrived at lake as we were eating and told us that the weather they had just come through was rather bad. Since their clothes still seemed to be wet, we might have guessed that but we had confirmation of what we expected. After our break we set out again and in a few more miles came to Robin Hood Inn which is one of the places where one stamps their passport. Had I been alone, I might have stopped for a pint. But given the approaching weather and the distance to Corbridge, the next overnight, it was probably best that I didn't. A few minutes after the Robin Hood Inn I had one of those strange experiences which is upon you and then gone before it truly registers. On the left side of the road we were walking along K. walked up to the corner of a pasture and looked out over the animals. As she stood there, I watched as one cow after another ambled over toward that corner. Soon cows were literally galloping from the distance, all to stand in that corner. Never a sound was heard and K. certainly did nothing which I could see which might have summoned the animals. I quickly snapped a picture or two but failed to put my camera into movie mode to capture the events. Could the cows sense that K. lives on a farm in New York? Why would they come anyway since K. raises sheep and shouldn't have any sort of magical power over cows. Oh well, we'll never know . . . Since our lodgings were in Corbridge some miles off the wall path it was necessary to detour toward the south. The route was a bit vague through this portion, or at least it was vague to me. I do remember passing a very neat farm estate on my right complete with what appeared to be a family chapel (or was I misinterpreting?). There was no doubt that it was just about to start raining so I dug out my ancient poncho from the pack and got it on in preparation. Had I been alone and had the weather been more settled I might have made a detour of a few miles about here to go to Aydon Castle, another English Trust property. There was no such luck this time but perhaps next time there will be. 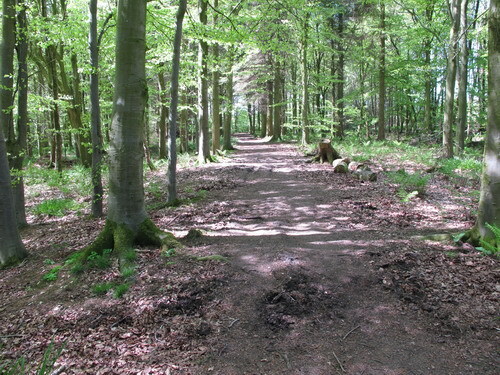 The route toward Corbridge degenerated into a bridle path descending steadily toward the bottom of a valley. This is about the time the rain came. And it came with a vengeance. Probably the worst part of the rain was that the descending bridle path turned into a stream and the water carried along the gifts that the horses had distributed so liberally along the way. At the bottom of the bridle path there was an underpass beneath the A69 where we stopped to check maps. This is when I first came to suspect that my poncho, which I have carried on numerous hikes over the years, was lacking in one key area -- it didn't seem to be waterproof. I confirmed this later when we had to leave the underpass and slog along as the rain became heavier and we entered the northern part of Corbridge. In the heavy rain I abruptly parted ways with K. and T. since their lodgings were in a different part of the town than mine. Finding my B&B for the night proved to be quite tricky. Eventually I got to the heart of town and, lacking any street signs, I stopped at the Shell station to ask directions. The attendant didn't know where the B&B was either but a driver who came in said that the address should be up the road a half-mile or so. This proved to be the case but getting there was a bit nerve-rattling since the road was fairly busy and hemmed in on both sides by walls leaving no safe place to walk. I discovered later that in the rain I had missed a path running alongside the road where it became most dangerous but that was of little help the first time. Thus, I found my way to the B&B sodden and grumpy. The building was large and imposing even from the back where I entered. Clearly it had been an "upstairs-downstairs" sort of place back before WWI. My mood didn't improve much that night since the room I was destined for was tiny. No, really, it was tiny. The old term "not enough room to swing a cat", although it doesn't actually refer to the feline variety of cat, applied here. This room probably was not big enough to even contain a largish cat if there were a human occupant and any sort of luggage present. Adding insult to injury the bathroom facilities for this room were "down the hall". There was nothing to be done about it though so I settled in as best I could and then started thinking about food. All the way through Corbridge in the rain I hadn't seen any restaurants or pubs or anything else food-associated. Eventually I made do with some biscuits and tea from the tray in my room and an orange left over from lunch which I found in my pack. Oh well, at least the rain had tailed off and there would be no trouble sleeping tonight. ↑ ↓ I awoke inappropriately early at 5:30AM but didn't really get moving until 6:00. There was plenty of time to wander back to the center of Corbridge for some photography and sightseeing before breakfast at the B&B would be served. I discovered the path along the dodgy stretch of road and got into town in no more than ten minutes. I also discovered that in the rain the night before I had walked past the entrance to the square where there were eating establishments, numerous stores, and a bakery. I made good use of the bakery since I was ravenous after the enforced starvation of the night before and enjoyed a nice little apple confection. 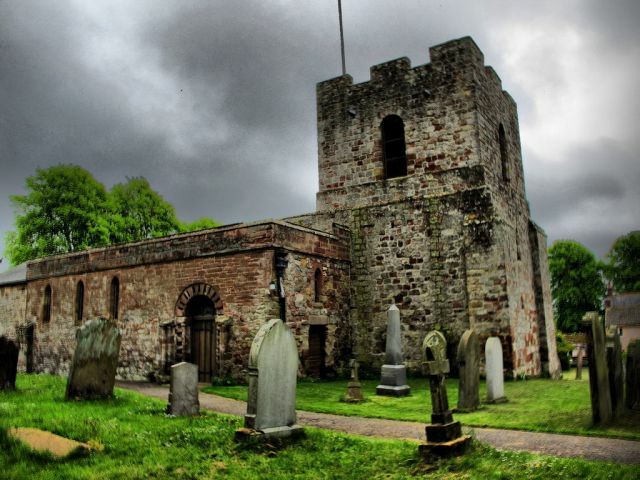 There is a fine Anglo-Saxon church, St. Andrew's, dating from around 786AD adjoined by a pele tower built using Roman stones on the market square. Both are lovely specimens. PELE TOWERS: A brief digression: pele towers (sometimes spelled peel) are fortified keeps which were built across England and Scotland in the 15th century which acted as watch towers and signal towers and ultimately as refuges from raiders. 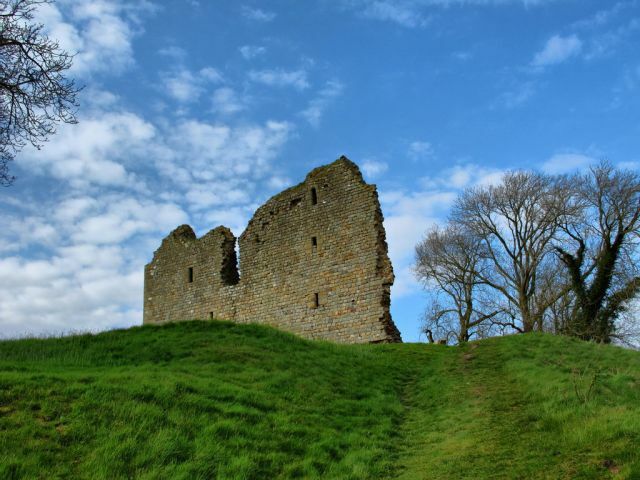 The Reivers from both countries carried out attacks across the border to steal what they could, and the towers offered a place of safety for the local lord and often would provide protection to entire villages during an attack. 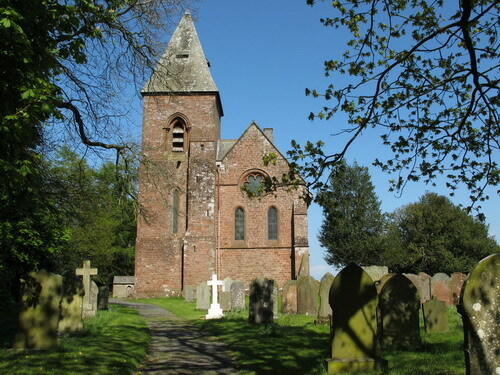 Some pele towers were associated with churches and eventually some churches were built using the pele as the church tower, or at least appear to have been; the church at Burgh by Sands (pronounced Bruff by Sands) certainly appears to be identical to a pele tower. 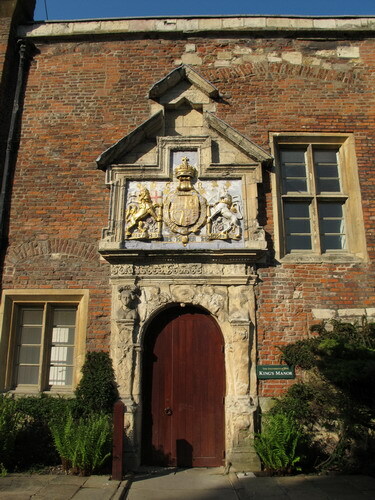 Others were eventually incorporated into manor houses in more peaceful times. At the assigned time I showed up at the dining room of the B&B for breakfast. As opposed to my room, the dining area was large and bright and airy having been set up in a parlor or sitting room or whatever it was called in the Victorian era. Breakfast was as before. I did have a chance to chat with a couple of elderly English lady tourists about our respective plans for the day. They were traveling to the east coast to visit Holy Island but seemed to be intrigued by my plans to walk all the way in the other direction. I got myself organized and finally set out at 9:15AM for the next bit of the walk. Because of the detour south that I had made there was a bit of a loop to make which was to lead to the City of Hexam before getting back to the wall itself. 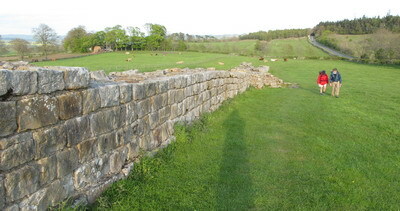 Sadly, I missed seeing the Corbridge Roman Town site of the fort Coria (alternatively Corstopitum) which was a major hub of activity during Roman times starting in about 90AD, sitting as it did beside a major bridge across the Tyne and on a major north-south route. But my own route lead off the south again taking me across the old stone Tyne bridge which was completed in 1674 and which was the only survivor crossing the Tyne in the floods of 1771. This "new" bridge is not far down stream of the site of the "old" Roman bridge. I met up with K. and T. for one last time as I headed down the hill toward the river. They were heading up for some sightseeing and we never walked together again although I saw them several more times along the way. 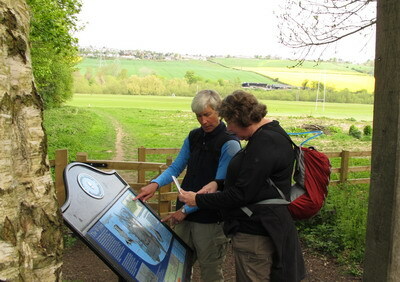 Eventually the path winds back to the north and Hexham. 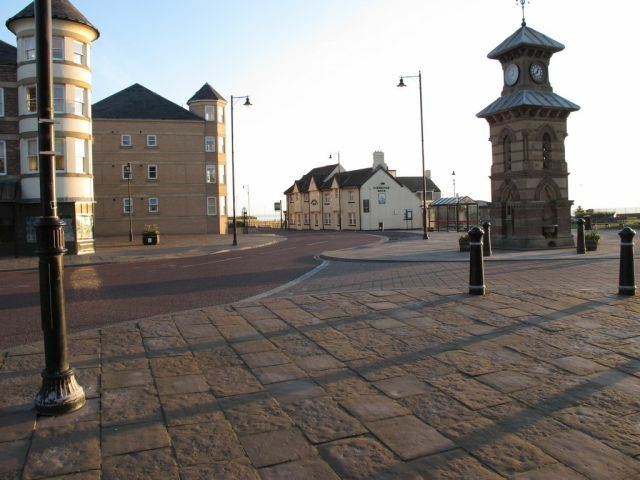 This is the beautiful main market town of the region and still has a lot of its medieval ambience. 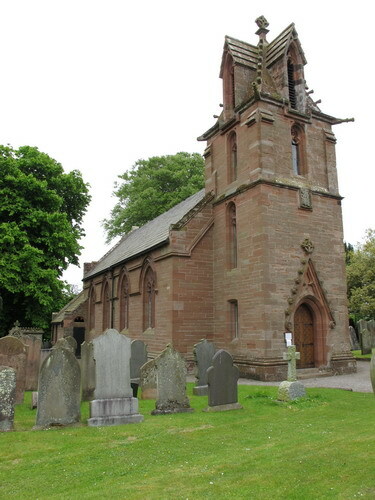 The original Abbey was built there in about 675AD although there have been many alterations and additions since then; it is now the Parish Church of St. Andrew after several incarnations. I took the opportunity to sit in the lovely garden beside the bowling green at Hexham House and had my packed lunch. The tulips were in full bloom and everything was amazingly tidy. It would take more time than I had to spare to really see Hexham and I will certainly go back if I'm in the area. But the time came to leave and I headed north again and soon crossed back to the north side of the Tyne and toward Acomb. Time for a navigational anomaly. Read that as getting lost. Getting to Acomb was quite easy and my route took me past the old church of St. John Lee south of Acomb. The church is modern, at least by local standards, and was built in the 19th century but the parish and the site seem to trace back to at least the 10th century. It stands in a clearing in an old forest; indeed, the name St. John Lee means St. John in the field / clearing in the woods. Enough of that and on to getting lost. My path was meant to take up the hill to Acomb until I came to the pant (fountain) where I was to make a slight zig to the left and then a zag to the right. Looking at Google Earth it appears that somewhere between the zig and the zag or soon after the zag I veered off to the right and wound up following an old strip of woods surrounding a stream. Very pretty. Sadly. according to Google Earth, it left me a good 0.4 miles east of where I should have been and this became clear as I wandered into a large caravan park (campground). Luckily the nice couple (caught by surprise by the camera) who manage the park checked around and eventually found someone who knew the way back to the wall. In any case I had some time for a chat with them and learned a bit about the area. The way back to the wall proved to be easy enough and had I had Google Earth available it would have been obvious that any path leading generally north would have gotten me back to the wall. As it was I wound up quite a bit further east than I should have and soon found myself passing St. Oswald's Tea Room and then finding a path across a field leading to St. Oswald's Church. I had heard the name King Oswald at some time in the past but didn't realize that he was a saint too. 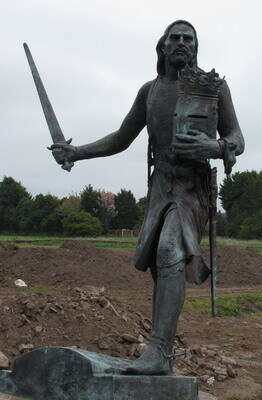 Somehow it seems odd that a 7th century warrior-king who lead an army into battle at Heavenfield (the very field in which the church stands) would wind up sainted. But I've since learned that he is credited with saving Celtic Christianity and is still held in high regard over a broad area extending as far as Italy. Sadly the church is not nearly so impressive as Oswald's legend, the present building dating from the 19th century but built on the site of a Saxon and then a mediaeval church. But enough of that. There was still a long way to go before there would be any rest. A site called Planetrees was next followed close on by Brunton Turret. Honestly, at this stage all I can remember that getting to the remnants of the turret involved wading through a very muddy stretch in a field full of nervous sheep. Nervous sheep were nothing new since lambing time was not long past and the ewes are protective (in their own sheepish way) but these seemed especially up-tight. But I dutifully snapped my pictures and pressed on. 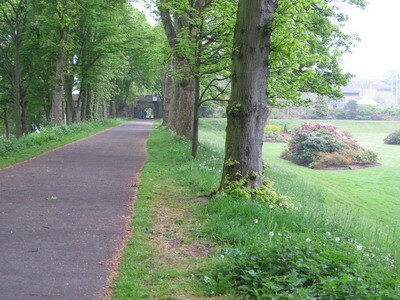 The path lead to Chesters Fort (Cilurnum in its day) after crossing a river into Chollerford. 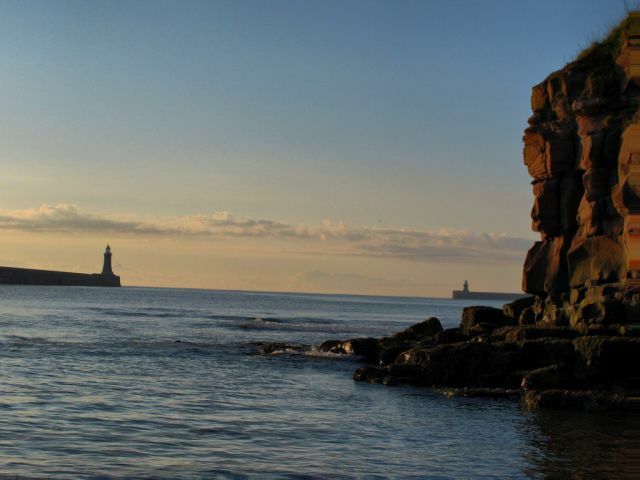 The fort is located above the North River Tyne. Given the lateness of the hour and the approaching closing time I was forced to bypass Chesters for now and start looking for my lodgings at a working farm which was somewhere up a big hill and to the right. Since it would only be at most two or three miles back to the fort it seemed best to backtrack and see them in the morning. I used my mobile (cell phone) to call the B&B to tell them that I was coming but would be a while just so they wouldn't given away my room or call out the rescue squad to look for a lost walker. I did finally make my was to Greencarts Farm after picking up a couple of walkers from Michigan, USA who were looking for the same place. They were far more ambitious than I, carrying all of their stuff in backpacks and doing 15 to 18 miles a day. Tonight at 7:30PM I was pretty well walked out and if I had been saddled with a heavy backpack I might not have made it before midnight. A ride to the local pub for dinner would have been available had I been more timely but I was out of luck in that regard. Oh well, maybe I'll lose some weight and that wouldn't hurt me a bit. ↑ ↓ Next morning I was offered and accepted a ride back down the country road and the big hill to Chesters. I had been "playing by the rules" since starting on the path but decided that this wasn' really cheating -- I had already walked up the hill and would do so again when I left so the distance was the same. Or so I reasoned. And so I rode. 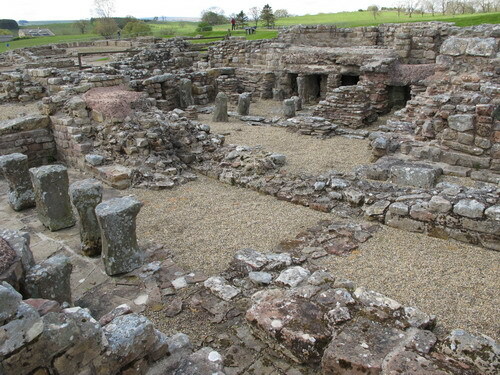 Chesters fort shows some interesting details of Roman construction, especially in the old baths. There is also a remaining abutment from the Roman bridge which is downstream from the modern span. I took the requisite pictures and walked the whole site and remembered to get my "passport" stamped. There was a party of two men and two women who, from snatches of conversation, I took to be either Danish (why Danish I don't know) or Dutch or German; I didn't speak to them then but we would meet up again sooner than I expected. I had noted, but without much enthusiasm due to the lateness of the hour, a huge and ornate stone building across from Chesters. 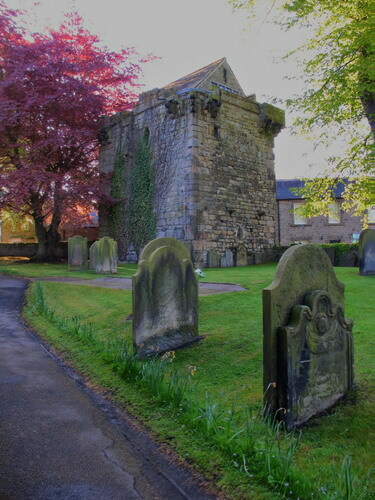 By ornate I mean stone walls, a dozen gable roofs, a tower and a tower clock. Not something one expects out in the country. This morning I had asked what sort of building it might be and was told that it was a stable. Stable?! Who would build something like that for horses. It turns out that the building was for sale too. With renovations it would have made a great condo building had it not been located miles and miles from anything. Enough staring at stables though, it was 11:00 and well past time to trudge back up the big hill and get on with the walk down the wall. There were some good bits of standing wall and earthworks along this stretch but nothing jumping-up-and-down exciting. Well, there was the point which is unmarked and which I totally missed where one reaches the northernmost portion of the wall, Limestone Corner, and thus the northernmost point in the Roman Empire. Kind of a mindless walk ensued other than it a few really muddy spots where it paid to be alert to avoid sinking into the muck and remaining for future archaeologists to find. It didn't get better when the weather developed into a misty rain but at least it wasn't the apocalyptic downpour that hit outside of Corbridge -- mist can be dealt with and my non-waterproof poncho wasn't nearly so bad as before. I wandered into the carpark which serves the Broccolitia Fort. Since it is right on the busiest road in the area it seemed to have a much larger carpark than most. But best of all it had an odd little three-wheeled coffee truck parked at the western end. Some hot chocolate was just what was needed to fight off the mist. Broccolitia is probably most famous today for the little ruin which sits just to the south of the site. This is the Mithras Temple which apparently was built as a place of worship by the soldiers assigned to the fort. It is little more than an excavated stone wall now but there are three stone alters at the far end (copies I've since found out, the real items having been placed in museums) but it does seem to have something about it. That might be because the rain ceased while I was there. Or it might be because people are still making offerings at the center altar. No, really. 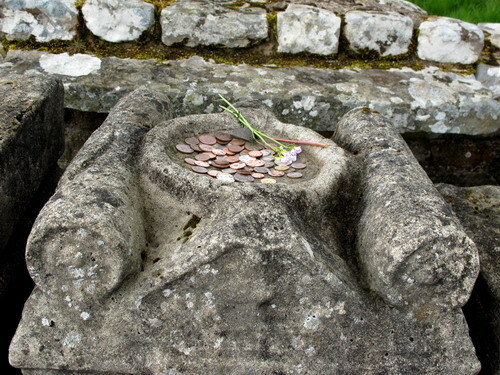 There was a pile of coins in the altar bowl along with a bunch of wildflowers. I didn't leave anything myself, figuring that the contributions I've been dropping in the collection box of every church I've been in along the way probably had me covered. A bit further on , just past the Grindon Milecastle there was a sudden change of terrain looking as if somebody had snapped the land in two and hastily put it back together without paying much attention to the alignment. This was the beginning of the Crags. The wall continued at the top of the cliff, the earthworks suddenly changing as there was no need for a northern ditch when there was already a formidable obstacle in place. To the north of the wall was a rather substantial precipice above pasture land which stretched off to the horizon. Rather muddy pasture land as the cows were squelching through it burying a good part of their legs in the process. Around here I met up with the male half of the party I had seen at Chesters. Turns out that the party was 3/4 Dutch and 1/4 English, two married couples. But right now there were just the guys (call them D. and E.), their wives having staged a sort of revolt which put them on the AD122 bus for a bit of a break. I walked along with D. and E. for a while along the line of crags for a while but their natural walking pace meant that my slower trudge was holding me back so at around 10:30 we parted ways and they disappeared into the distance. We would meet again. The crags continued for a long way but they were not, sadly, continuous. Continuous would have been too easy. Rather the crags started and stopped which meant making one's way down a very steep slope covered in large irregular stones and then right back up again over equally steep and treacherous terrain. There were several of these along the way and I dreaded every one of them. As a child I seemed to have ankles that are prone to sprains and, although the problem really was one of childhood, I've developed a dread of such uneven terrain. I could just imagine turning an ankle and launching myself headfirst down the rocky slope. Virtually all of the cragtop was pasture. The only place that I can recall that was different was a small woods and farm around Sewingshields Crag. The series of crags continued their discontinuous way for few miles with the usual procession of turrets and milecastles until it came to Housesteads Fort (Vercovicium to the Romans). This has been called the best of the wall forts and I certainly couldn't argue with that. Here the walls are far higher and in better condition than at the others and it gives a really good idea of what life might have been like here. Another stamp in the "passport". 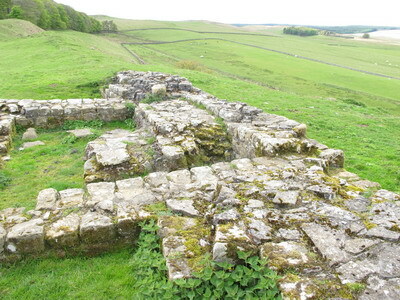 I met up with the D. E. party again at Housesteads, now back up to full strength with the return of the bus-borne wives. We went off together for the next stop since they were booked into the Saughy Rigg Farm B&B. Aside: rigg was a new word to me so I did a bit of digging: it has several different meanings but in this case it is an Old English word meaning a bumpy fell or ridge. Fell, in turn comes from the Old Norse. Interesting thing, the English language. It was further than I had ever imagined from the point where we were to turn off the path and go north to Saughy Rigg. We finally made it in at about 7:30. A quick wash up and change to less worn clothes and it was time for our late dinner. This was a treat given my sad luck at evening meals so far on the trip -- we had a real traditional English Sunday dinner with roast beef and Yorkshire pudding and all the accompaniments. As an experiment I tried some hard cider which the B&B had on tap. I wish now that I had a way to get Olde English cider here in the States. It was very well-balanced with a good apple taste and had a reasonable alcohol content. If I get the chance I'd also like to try traditional farmhouse cider or scrumpy which is potent enough to take a man right down. This is a regional beverage made in small quantities that is not often seen in pubs since it has a reputation for leading to a brawl before the evening is done. Two pints of scrumpy would probably have knocked me out but the two pints of Olde English were just about right to wash down the excellent meal. I tried to phone home after dinner but there was no signal to be found. That appears to be fairly common since the wall path goes through some isolated territory. There's always tomorrow. ↑ ↓ After the regulation breakfast the Dutch/English party and I hitched a ride back down to the path at a site called Steel Rigg which we had passed the previous evening. My next intended stop was the fort Vindolanda which would mean getting off the path yet again and venturing to the south a bit. On the way down the road toward Once Brewed I happened to come upon my original walking companions K. and T. who were coming up the other way heading back to the path after having spent the evening in the village. Their lodgings were closer and easier to get to but I'll bet that they didn't have a dinner as good as mine. 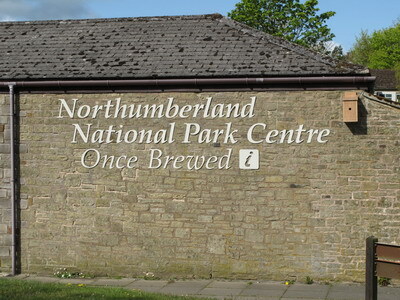 On the way south I stopped at the Northumberland National Park Centre - Once Brewed for a call of nature before continuing down the road for Vindolanda. I guess that there must be frequent questions about where the name came from so they've posted an informative sign to answer it. To quote the sign: "How Once Brewed got its name During the Jacobite uprisings, Bonnie Prince Charlie was seeking support for his cause in Carlisle when General Wade tried to give chase. The road from east to west, however, was so bad that Wade's army couldn't pass, and Charlie escaped back to Scotland. 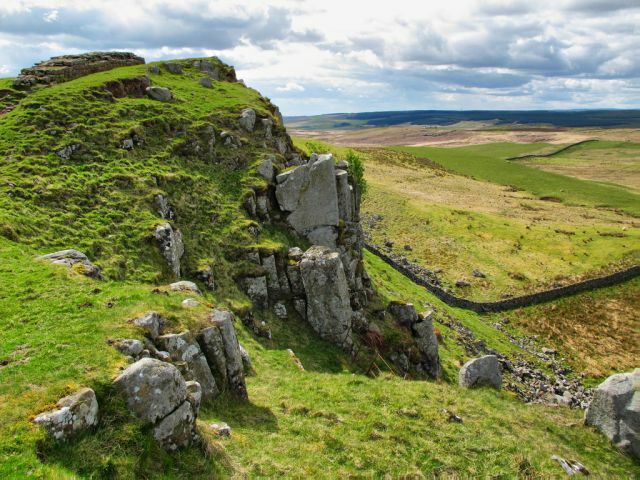 In 1751, the order came to build a new road along the route of Hadrian's Wall. The thirsty road-builders were glad to see an inn, about 200 metres west of here, but they found the ale so weak that they demanded it be brewed again. 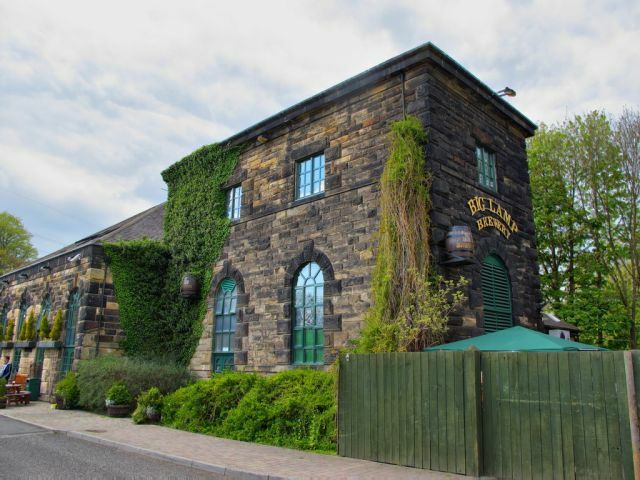 The inn, invariably, became known as the Twice Brewed Inn. In 1934, the Youth Hostel here was opened by a staunch teetotaler, Lady Trevelyan. She said 'Of course there will be no alcohol served on these premises, and I hope the tea and coffee will be brewed only once.' Ever since then, the Youth Hostel and the Northumberland National Park Centre have been known as Once Brewed!" 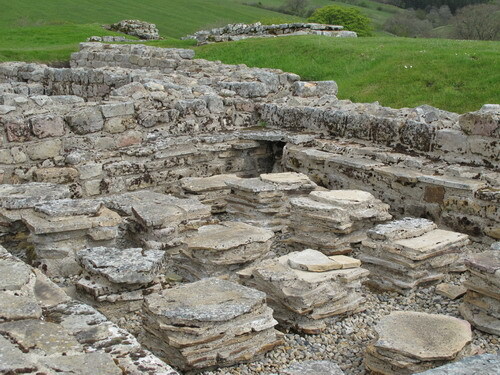 The Vindolanda fort is another site where one pays to enter. Even though it is only about £6 to enter it is apparent that entry fees could be a considerable expense if one were inclined to visit every possible site. Vindolanda is associated with The Roman Army Museum, one that I unintentionally missed, and a ticket good for both would save a bit of money. I've only seen digs on television and read about them in books and neither really conveys the true scope. There was a horde of archaeologists, students, and volunteers swarming over a couple of areas. What finally sunk in was how tedious most of the work must be removing soil gram by gram and digging down to some unknown depth hoping to find something important but almost never doing so. But, given the past finds at this site, there is still a good chance that even more will turn up even though the chance that any single digger will make the discovery is near nil. A bit past noon I decided that I had better get moving down the path so I backtracked the way I had come and then headed west again. I met a couple beside the wall taking a lunch break. They were from Washington, DC. It never ceases to amaze how many and the wide variety of people make this walk that I had only recently become aware of. Back on the trail I soon came to the highest point on the walk at Winshields Crag. It was only 345m high but given that this is not a mountainous region it seemed high. This was more of the crag walking like yesterday but didn't seem so relentless (I hoped). Maybe not so much of the up and down which threatened my ankles. This was a very empty region and probably always has been. Around 1:00PM I took a lunch break and sat down in the lee of the wall to get out of the wind. Parts of the wall up here are quite high, at least the infill portion. As everywhere more of the high-quality facing stones were missing. The altitude gave me a bit of signal on the mobile so I took the chance to call home while I ate and was glad to hear the everything was well. Bit of a trudge over the next stretch although there were many bits of fine wall. In fact this may have been the best portions of unrepaired wall so far. Eventually there was a descent to an abandoned quarry at Cawfields. This is a relatively modern quarry, not Roman, but I read that quarrying in this area was responsible for much destruction of the wall as they removed large scarps of a hard valuable stone where the wall stood. A very lonely stretch, this. I've seen only a couple of other walkers which seems unusual given the number I've seen recently. Perhaps it is just because it is Monday and the weekend walkers have gone back to work. But the near-total lack of people is a bit eerie. I certainly wouldn't want to wander out here on a moonlit night although the photographic possibilities are intriguing. Moonlight on the Wall and all of that. But this is getting to be a long trudge since I have to get through Gilsland to find my next lodging and at this point I don't know how far that is. My hopes of easier walking were dashed along this section as it got pretty rough and steep. Passed turret 44b, also known as King Arthur's Turret for some unknown reason, which is in excellent condition. Laid out on the ground inside are the original stones which made up the arch over the entrance. Some more up-and-down on the Walltown Crags and past some very substantial parts of the wall and the terrain settles down to something more walker-friendly. Sadly, this stretch is without much trace of wall -- just some earthworks remain. As I walked I was looking forward to finding the ruins of my first legitimate castle on the walk. 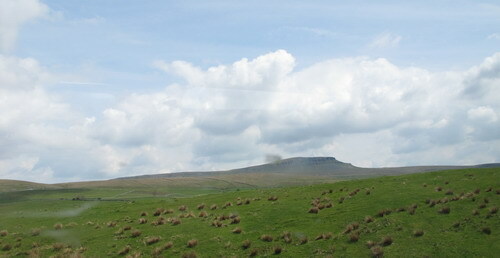 The hulking remains of Thirlwall (gap in the wall) Castle appeared on a rise on my right. This edifice could be called a building in very bad condition or a ruin in fairly good condition. But the sky was clear and the weather fair so I clambered around the remains of the keep for a while and snapped pictures. This fortified family home was built, as were the pele towers across this swath of England, in the 14th century for protection during the border reiving. My next lodgings were at a B&B south of Gilsland, somewhat off the path, but somewhere between the castle and the town I managed to get diverted from my intended path. Lost again but I still haven't figured out how nor how far off the path I had gone. Not that I didn't have an idea where I was bound but the directions to the B&B given to me by the tour company pretty much counted on me being on the path and not wandering down a randomly-selected country road. I eventually found my destination rather far afield and up a steep grade after using a railroad as a landmark. This meant getting into the B&B rather later than intended (a pattern developing). This was one of the three locations where I was booked for the evening meal. By the time I walked in I found that the other guests were seated in the dining room and eating. The hosts did a bit of a scramble and put together a meal of chicken breast and roast potatoes. Given the hour I guess I couldn't complain since some food was better than no food as I'd enjoyed after another late arrival. They at least had some local ale on tap to wash the meal down. And an apple tart with ice cream made up for some other lacks. Later, in my room I finally managed to get through on the mobile to the friend who and dropped me at the airport. Seems that I had the wrong number in my notebook and no pre-programmed numbers in the phone. The perils of hastily-planned trips I guess. 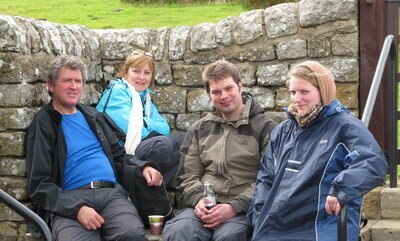 ↑ ↓ After a light breakfast I got back on the trail at 8:45, next destination Birdoswald Roman fort. It was a beautiful day and that lifted my spirits a good bit. The weather so far had not been truly bad (other than the deluge north of Corbridge) but clear skies had not been abundant and heavy grey clouds were more common than I would have preferred. There IS a reason that England is green. 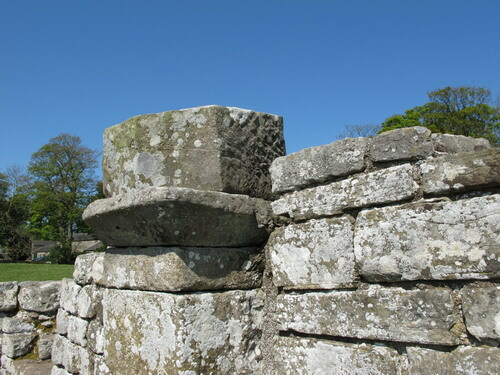 Between the next pair of turrets, Willowford East and West, and still within Gilsland there was a good example of narrow wall built on wide foundations. This was due to a change in the plans, either as a budgetary matter or because the building materials were of better quality, where the foundations for the wall had been already been built but the wall had not. Somewhere in this area was also where one passes from modern Northumberland into Cumbria counties, the border zig-zagging through Gilsland seemingly at random. Birdoswald was literally less than a mile from the B&B but it is necessary to walk back down the road and across the tracks and nearly into Gilsland to get on the wall path which extends the distance to 2.2 miles but this was not a great burden on a bright beautiful morning. 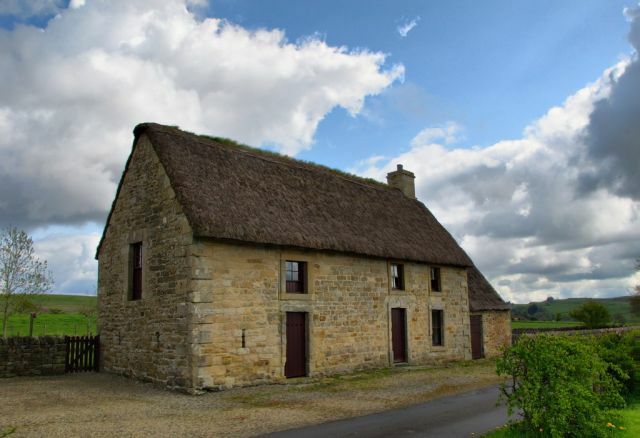 Birdoswald (Banna to the Romans) is a small site immediately adjacent to a pleasant Victorian farm house. The house is one of those that was built onto an existing pele tower and expanded over the years. The fort itself is still being studied by archaeologists and is said to be one of the best-preserved on the wall. Study suggests that the fort was occupied by a local warlord after the Romans departed and might have been so for a long time -- certainly to after 500AD. There is a visitor center with displays and artifacts on this English Heritage site. Actually, I made a great discovery at the visitor center although not a historic one: Fentimans Botanically Brewed Traditional Ginger Beer. This is some awesome stuff and it makes every ginger ale I've had in the US seem like... Well, let's just say that the flavor is superior to any other I've experienced. And actually I guess Fentimans is at least a bit historic having been established in 1905. I have found that it can be purchased in the US but no near where I live and buying it and shipping it in would put it in the price range of good wine. One other historic thing -- in the beautiful sunshine I was able to zip the legs off of my hiker's pants and enjoy shorts for the first time on the trip. Another stamp in the "passport". Only two more to go. I got away from Birdoswald by 11:30 and 12:20 found me in a place called Comb Crag Wood. This is a tiny stretch of woods but the timing was perfect for a lunch break. Looking at maps and aerial images on Google Earth I think that I can identify this patch but I wouldn't bet on it. But it is just about the only location where the wall path goes through any sort of woods before getting to the village of Banks. For certain it is before the remains of turret 51A and I was there by 12:45 so I can't be too far off. This is on the path of the turf wall and the only real landmarks to go by are the Roman ditch and that is often difficult to spot. In any case the woods were shady and cool and full of bluebells and there was a convenient fallen log to sit on so it became my lunch spot. A bit further down the path is the village of Banks. 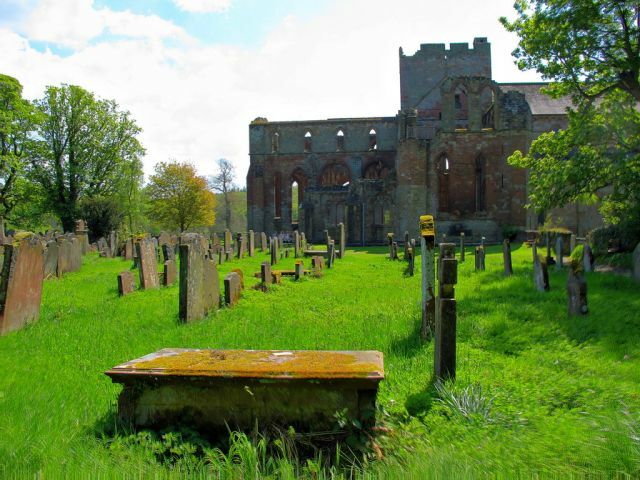 This is where I made a bit of a detour south to take a look at Lanercost Priory. I guess that overall this cost me perhaps 4 miles of walking but it was definitely worth it; I'm finding it nearly as interesting to look at old churches and village buildings as it is to view Roman remains and when it comes to churches in this area Lanercost Priory is not to be missed. The weather was getting warm enough that after noon I actually began to sweat a bit by the time I got down near the River Irthing. 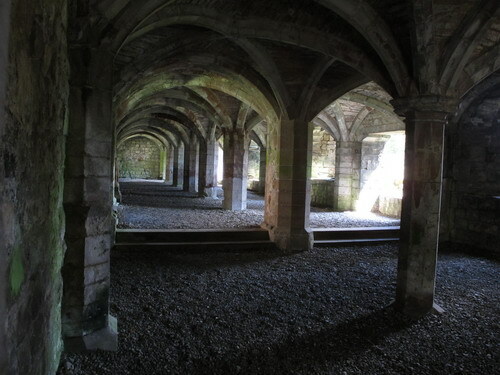 The Priory was established before 1170AD by the de Veaux family (note this was all of 100 years after the Norman conquest and most powerful family in this area was now French) and was built to house Augustinian Canons. The Priory took a good 50 years to complete but, being on the rough-and-tumble Scottish border, it was sacked in 1296 by William Wallace. Worse was to come when in 1536 Henry VIII dissolved the monasteries and the buildings were demolished for their valuables. 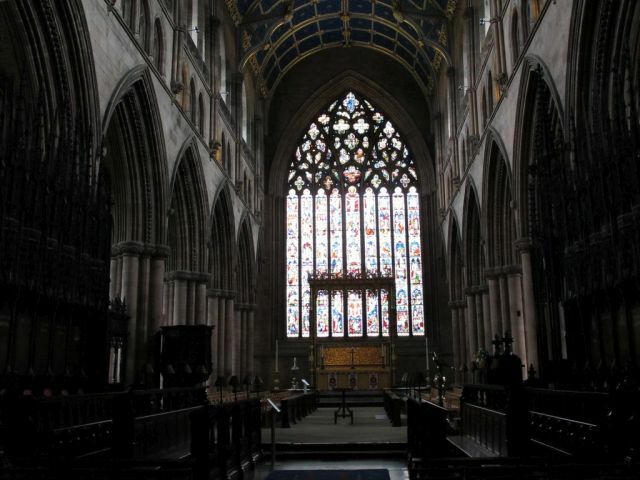 The nave of the Priory, much of which remained, was made into the parish church. 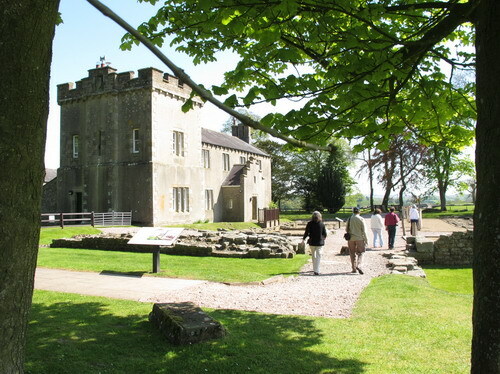 Control over the Priory properties fell to the Dacre family who were in favor with Henry VIII and it stayed with them until complex inheritance and marriages shifted the balance to the Howard family. The buildings did not fare well during the following centuries and were essentially ruins by the mid-18th century. 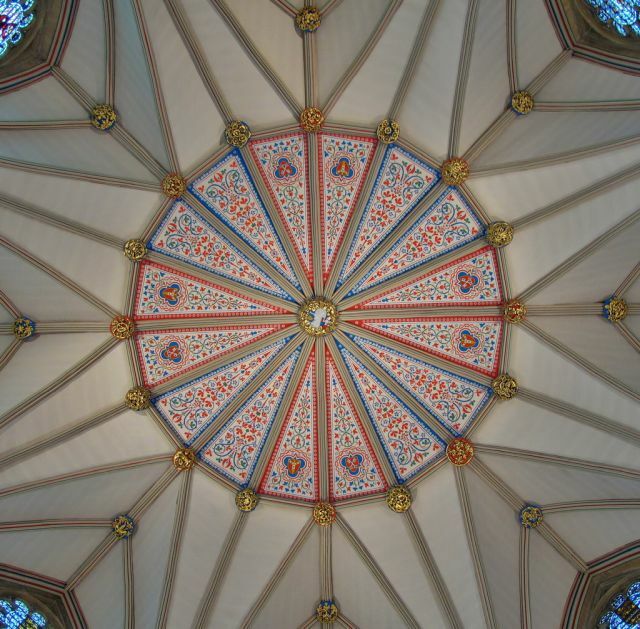 Eventually the crown and the Howards and the local parish succeeded in having needed repairs and restorations done. 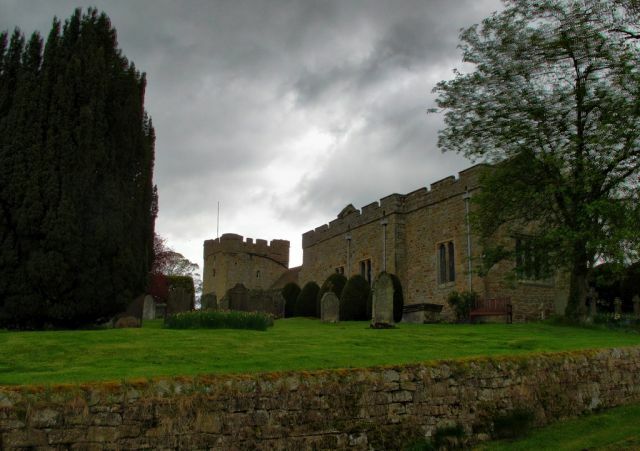 The Priory was eventually left under the control of the a partnership between the local parish and English Heritage. Needless to say, all of this history has left the buildings in a very mixed state- everything from bare foundations to magnificent structures is left. There are too many things to write about this site for me to do any more, and perhaps I've already gone too far, so I suggest you do a bit of searching on the web to find out more. The priory has, of course, a gift shop and, though I do my best to avoid souvenirs, I sometimes buy a guide book if the location is especially interesting. Otherwise souvenirs are out but this time I gave in to the temptation and bought a T-shirt but really only because of the design which features the slogan "WALK ON TH EDGE OF THE EMPIRE". It seemed the least I could do since I knew that the title of this section of my website would be almost identical. I got back on the path and headed off toward the village of Walton. There is not a lot there but there was the promise of the Centurion Pub and a pint to slake my thirst. Sadly, when I got there I found that the pub had been closed for some time. There were new owners and they were there doing repairs but no amount of pleading on my part would gain me a pint of ale so I pressed on toward tonight's lodgings in Newtown but it would be some hours yet since I managed to get most annoyingly lost again. I wrote annoyingly and annoying it was, both for me and the livestock. 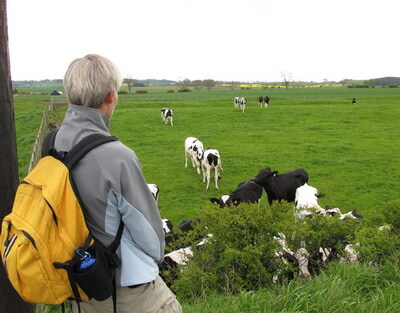 Following the path quite carefully I started to traverse a long field with some cows and their calves in it headed for the far end figuring that somewhere along the way there would be a sign or at least a worn path to show me the way. At the far end I had not found anything so I doubled back to find what I obviously had missed. The cows were becoming a bit nervous having a stranger near the calves and grouped together watching me. Back at the beginning of the field there was still no sign of a sign besides the one directing me into the field. So, back down the field I trudged once again past the cows who were becoming hostile by now. This time I gave up entirely and when I got to the far end of the field I unwired the gate and slipped out onto a dirt road which seemed like it must eventually go somewhere. Well, it did but only to another gate and another road. And this lead to another gate and a slightly larger dirt road. Eventually I got to an actual paved road and trusting in luck (and my clearly failing navigational instincts) I made a right turn and headed off to find my fortune. Things got a bit worrisome when I got to an intersection of country roads and found a sign pointing the way to the Carlisle Airport which was apparently 4 miles away. Not good. Not good at all. I was going to Carlisle alright but not to the airport and I shouldn't have been that close, or so I thought. By now the location of the wall path was totally lost to me and dead reckoning was getting me nowhere and my maps, being of the official path, were of no real use. Eventually I resorted to the mobile, there actually being a signal, and phoned the next B&B for directions. It was a bit more than mile down the road (and up yet another hill -- why always a hill leading to the B&B?) until I found Newtown which lies right on the wall path. Clearly I had walked down a series of dirt roads perpendicular to the correct route. This is especially irksome since I did have a compass with me despite a dearth of usable maps and by now it was getting late enough in the day to know where the sun was going to set. Sigh. Got into the B&B some time after 5:30. The dinner at the B&B was good although my appetite wasn't. There was a nice rhubarb crumble with ice cream for afters. I really could have used a pint about then but the only pub in Newtown had closed. The next village with a pub was Irthington but, since the two miles down and two miles back were demotivating, my thirst was not strong enough to move me so I went pint-less that night. As on the first day this part of the path was essentially all near a river but this time it was the Eden. The last part of the walk wandered through various park-like areas until it actually did put me in Rickerby Park crossing the footbridge at 12:30PM. As fate would have it I met up with K. and T. again in the park although this it was only in passing as we determined our respective directions. Getting so close so early was quite satisfying since it meant that I had actually managed to match my location with the written directions to the guest house where I'd be staying the night. The weather was threatening to rain, or at least mist, but since my destination was within a km and the directions were totally clear there were no worries. I arrived at the Courtfield Guest House at 1:00PM. I took the opportunity to wash some socks and then headed out to find the place where I was to obtain the penultimate stamp on my "passport". This turned out to be a chore because of confusing pedestrian underpasses across the main thoroughfares which never seem to put me where I wanted to be. But eventually I did make it into the Sands Centre and did what needed to be done. Since there was a pub just across the car park I dropped in for a pint. Somewhere along the way I'm sure that I must have eaten something but honestly I can't remember where or what. By 3:00PM I was out on the streets again doing a bit of sightseeing in Carlisle. 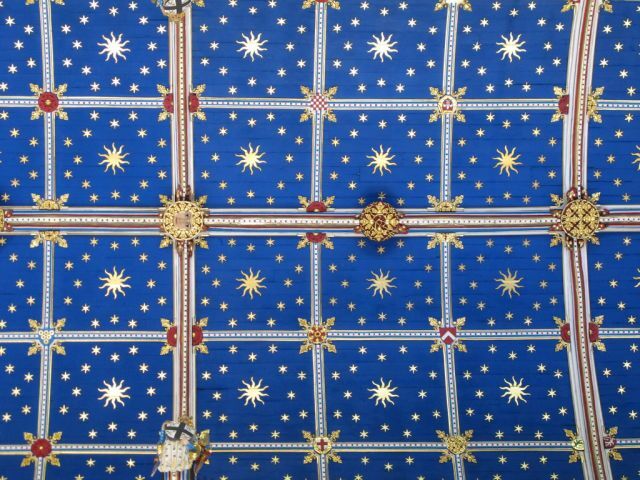 The Carlisle Cathedral is quite attractive inside and out and has an especially beautiful barrel-vaulted ceiling in the nave. 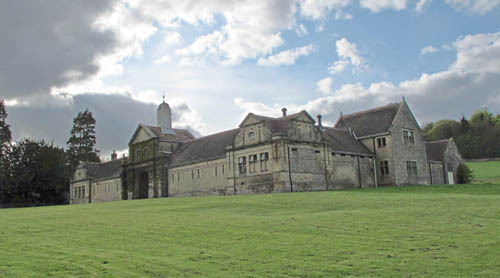 The entire building is largely rebuilt on the site of the original 12th century Priory. Over the years various parts were destroyed in wars and raids but some near-original 14th stained glass remains along with some extraordinary carved wooden screens. The lowest level of the cathedral contains a display of the treasury and it may be toured. 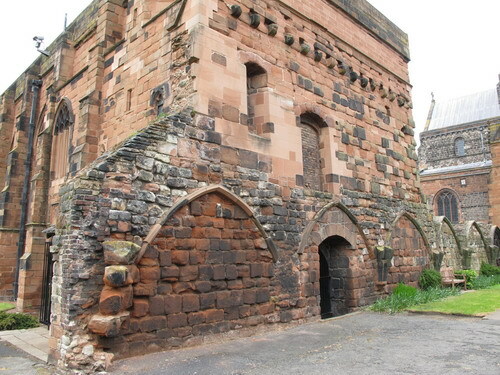 The cathedral sits in a the walled Abbey and many historic remnants of the original buildings can be seen. One sight I wasn't prepared for was a carved memorial bench bearing the opening lyrics of "Love Me Tender" dedicated to the memory of Jimmy Henshaw. You just can't make this stuff up. I wandered the city, or at least the center of it, for hours. There is a most impressive fort there but yet again I was really too late to enter this English Heritage site. Later in the evening I set out looking for the internet caf‚ I had spotted earlier and then a meal and a pint. The internet caf‚ turned out to be a non-event. After being without internet contact for so long I was surprised when I checked my email and found 117 messages. Perhaps five of the lot were of any use and the rest were immediately deletable. It leads me to wonder why I am so compulsive about checking email when I'm at home -- surely the percentage of junk is just as high while I'm there. After my visit to the internet I wandered into the Beehive pub which was right down the street from my lodgings. The pub was a bit noisy and generic but they served one of the best prawn salads I've had so all was not lost. Lost some sleep that night because I called my Mom to give her a progress report and couldn't get in touch. She almost never goes out and never for very long so I called a neighbor of hers who has a key to the house and he verified that she wasn't at home but there was no sign of where she had gone. ↑ ↓ This is the last day of the official walk and it is going to be the longest one -- nearly 16 miles as I figure it which is 2 more than the second day. This will be something completely different since almost all the walk will be across land as flat as Kansas. It seems that the walk will be a total of 93 miles, exclusive of miles added on by getting lost or intentionally wandering afield. Quite possibly today's biggest hazard will be boredom rather than getting lost since there are few places where one might go astray. Hit the road at 9:10AM or thereabout. It wasn't too many minutes after starting out, reversing the route from the B&B to the path, that I came across the Sands Centre once again. Seems that I could easily have saved the effort of the previous day and waited but I honestly had no clue it was as close as it was. 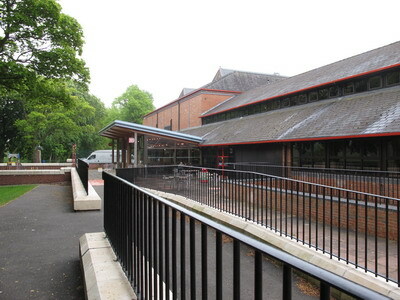 The building sits right on the River Eden beside the Eden Bridge and is a general purpose venue for entertainment, sports, conferences, meetings and exhibitions but day-to-day it serves the region as a physical fitness facility with swimming pool and gymnasium and exercise equipment. The on-site café is where the passport stamping takes place. The path follows close on the river out of the city going through parklands until suddenly changing into somewhat muddy rural country. On the river I found someone tending to what looked like an undersized yellow torpedo on a tether. The man was a government hydrologist and he was tending a device which monitored water condition and flow. At that same place I spoke to a couple of other female walkers -- the Australian contingent. I'd seen them sporadically on the trail all the way along but had never met them. They were on pretty much the same schedule as I so I really should have spoken sooner. 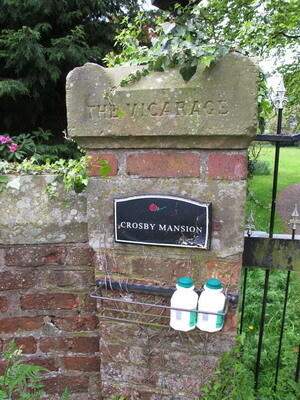 Even this close in to Carlisle the area was purely rural and supported some largish dairy herds. Eventually, at the village of Beaumont the trail veered sharply westward away from the meandering river for good. 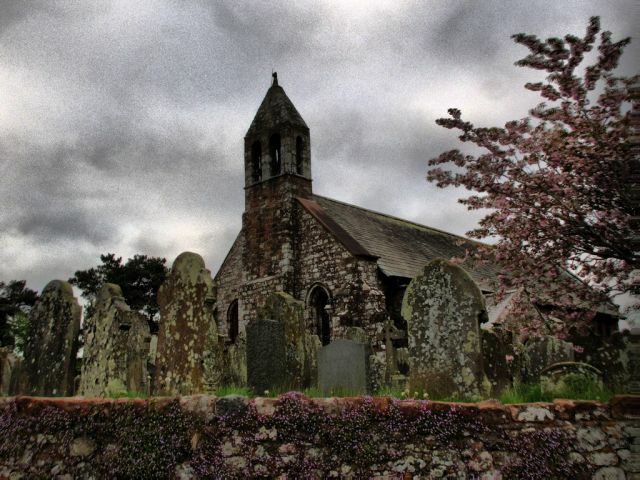 Next up was Beaumont with its own village church and graveyard which needed photographing. I've heard of people who do nothing else on holiday but going from church to church, graveyard to graveyard. I hope I'm not turning into one of them but they do seem to hold a fascination. Beaumont was a perfect place to have lunch while sitting under a tree in the middle of the village; I also managed to phone my Mom while sitting there so I felt better instantly. The path bypassed the village of Kirkandrews-on-Eden. I know nothing of the place except that it is listed as one of the "Holy Wells Of Cumbria". Perhaps they should meet up with the people at the Dilston Physic Garden and discuss things? 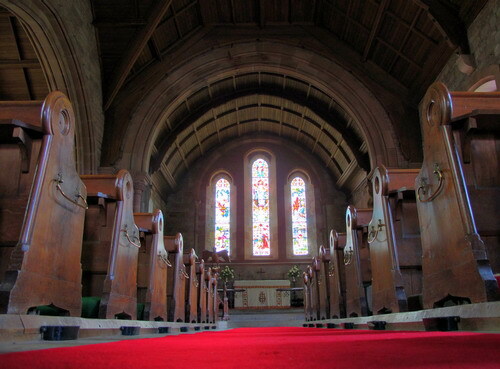 Next up was the pretty village of Burgh-by-Sands and yet another village church. This one was interesting for the square 14th century tower which certainly looked like a pele tower to my uninitiated eyes. The church, St. Michael's [picture at bottom-left], was built with stones from the Roman fort Aballava which stood on the village site. The church was interesting enough to warrant a visit inside earning them the traditional donation. There is nothing remaining of the fort or of any other permanent Roman structures along this entire stretch except for hints of the ditch and vallum. Odd, since this was one of the most heavily fortified stretches of the wall. A few more minutes and I came to a rather new statue and plaque recording the fact that in 1307 King Edward I died at the village while leading a campaign against Robert the Bruce. History is almost inescapable around here. Probably of equal interest was the Greyhound Inn right next door where I had a half pint of Black Sheep Bitter while sitting on the patio so that I'd feel justified in using their loo. A win-win situation. Photo-worthy scenery was a quite sparse along this stretch. 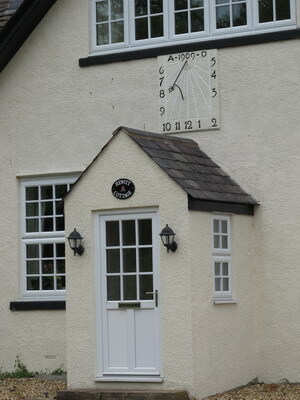 A pretty white house that has a sundial gnomon projecting horizontally from the wall; petals from cherry trees drifting along the road; and then through the villages of Dykesfield, Drumburgh, and Glasson. An ancient (14th century) stone farmhouse with a sign calling it Drumburgh Castle. A sign pointing the way to a holiday park but which looked like a huge caravan park. The path veered toward the marshy shore of Solway Firth in the middle of this. There was a prominent warning sign at a point along the trail warning that the tides can affect passage through the area and some incomprehensible tide tables. I met a Scottish couple for (from Perth as I recall) by the sign and talked for a bit before they headed off while I sat on a bench and considered. A bit further on a sign declaring that "When Water Reaches This Point Maximum Depth Is Three Feet". They must have been serious because I came to a warning sign telling me not to swim and the sign had a life ring attached to it for instant use. Good thing I wasn't planning on swimming (or even) walking in the marsh. Now that I could understand quite clearly. Luckily the water was still well out past the marsh to the right and presented no eminent danger. The path bypassed the little village of Port Carlisle; the village had once been a center of promising commerce but everything came to naught and there is not much to see except for an old dock and customs house and the path where the railroad once ran. The only sign of life was some men fishing where the old canal ran into the firth. 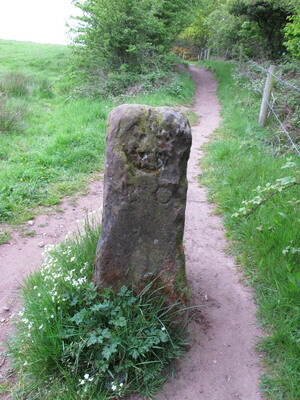 Only a bit over a mile to go to Bowness-on-Solway and the end of the long walk. By 5:08 I was at the little gazebo structure which marks the end/beginning of the path and I talked for a bit with a Canadian couple just finishing up the walk. "Ave terminvm callis hadriani avgvsti pervensisti" as the sign above the door said. I chatted to a couple of others at the gazebo and got my last stamp in the passport and went off to look for my night's lodgings. On the way there I was diverted for a while by the village's Norman church which, not surprisingly, is right beside the Old Rectory B&B where I was to stay. This small church, St. Michael's, is one of the best I've seen on the walk [picture at bottom-right]. If a building ever had character, this is it. A score of pictures from various angles and I was on my way next door. By 5:30 I was sitting on the bed wondering what I would do next. 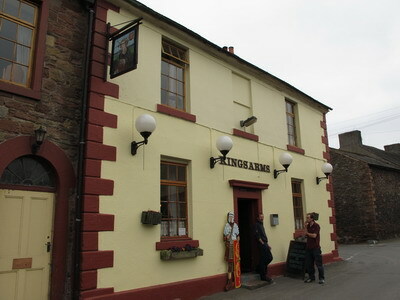 Well, there was one thing that was on the schedule -- a good meal and a pint or two and the literally the only place to do that is the Kings Arms in the center of town so after cleaning myself up a bit (well, a lot really) I headed off that way. 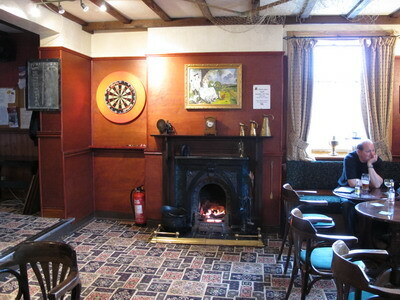 This establishment filled my expectations of a village pub perfectly -- far better than any other I'd seen on the walk. No pretensions and overflowing with character describe it exactly, down to real a coal-burning stove and fireplace at opposite ends of the main room. 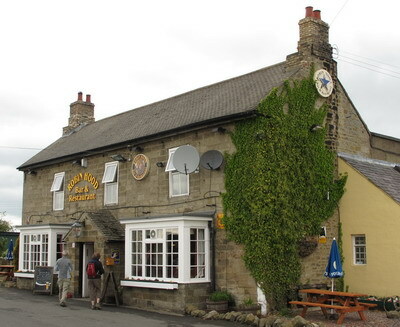 This pub could be considered the real end of the walk for nearly every walker over the years. They've capitalized on the fact but not in an obnoxious way. In fact they saved me a great deal of trouble. It had appeared that I'd have great problems getting my certificate of completion since it is assumed that such would be mailed in exchange for the passport and some money but from outside the UK I didn't know how it would or could be done. 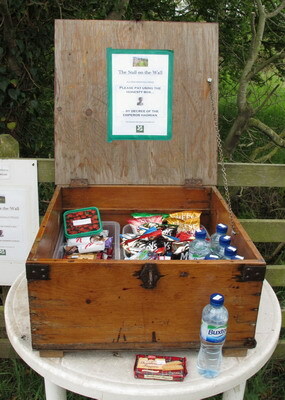 Luckily the pub also gives out the certificates as well as keeping a walker's visitor's book and selling some souvenirs. I broke my own rule about souvenirs and got myself a patch which I'll have sown onto my daypack and a pin which I have no idea what I'll do with. Something that the person cleaning up after my death can puzzle over. Quite importantly for the moment the pub offers some good dinners. I had the chicken curry and found it quite tasty. Of course there was a bit of ale to go with it. The dining area in the pub looked like old home week, holding as it did K. and T., the Australian Contingent, and the Canadian couple. It would probably had the Dutch/English party too but they had been forced to cut the walk a day short and return home. After dinner I found that it was still early so I wandered the village for a while, took a few more pictures, and then headed off to bed. The next morning would not be an early one since the bus schedule was set up for either workers or shoppers and I wasn't hot to get to Carlisle and run to the office. The shopper's bus was definitely the one I wanted. So off to bed I went with the feeling of a job, if not well done, done completely. ↑ ↓ There was no need to get up early so I took my time. Of course there is always something that needs to be done even while traveling. One thing in desperate need of doing was packing. Since the walk started there had been very little in the way of packing and unpacking. Now I was changing modes and had to re-stow the hiking boots and the dirty laundry had been growing steadily. In fact the laundry was reaching the toxic material stage. Luckily I had one of those zip-up plastic clothes bags which allowed me to stuff everything inside, seal, and then sit upon it to force the air out so the volume could be reduced a good bit. Stuffing other items into regular plastic bags and then into the boots took care of them neatly. At breakfast I talked briefly with a young man who was setting out in the other direction on the wall path. Well, (OK so I noticed his pretty wife first) He was planning to do the wall in TWO DAYS. I was flabbergasted. But my amazement quotient went off scale when I learned that the record for running the wall path from end-to-end was 19 hours and 24 minutes, set by a Yank stationed with the USAF at RAF Mildenhall. After breakfast I saw that there was still a lot of time remaining so I walked around the B&B's pretty garden and then went back up to look at the Norman church in a different light than the evening before. I also went inside to see what was there. The church proved to have a neat little pipe organ along with well-done stonework and carving as well as a wooden vaulted ceiling. I left my donation and then wandered up past the Kings Arms to the bus stop. Kind of old-home week: K. and T. were there along with the Scottish couple I'd met on the way into Bowness. I can't honestly say who else was waiting and my notes are useless in that regard. I'd guess that the Canadian couple and the Australian contingent was there too but I wouldn't swear to it. The Stagecoach in Cumbria 93 bus showed up at 10:20 after driving down the village to a place out of sight where it turned around. I have nothing but respect for the driver -- he was driving the large motorcoach through village streets which, if they could be said to have been designed at all, where designed for a horse and cart. Clearance was nil in some places. 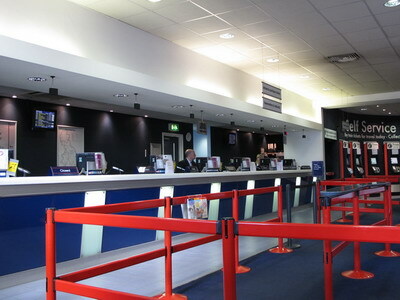 We made it into the Carlisle bus station at 11:02. The train station was a bit of a walk from there but it didn't take long so I had time for a bite to eat and was sitting on the train at 11:51. The train ride was a bit long since there was a change at Leeds. The scenery riding south was very interesting and sometimes spectacular. I'd read and heard about Yorkshire Dales and how they were a magnet for hikers. It is easy to understand why. The fells are a major part of the scenery but they are not actually that high when compared to mountains elsewhere but they make up for that by, for lack of a better word, I'll call presence. At least once I noticed that there was still snow on a fell and a couple of times I saw parties of hikers, large parties, near the tracks. I would certainly consider going myself if the opportunity arose. I departed the train at York at around 3:00PM with no idea where I would be staying that night. All I knew was that I didn't want to be in a tip or a place that was beyond my limited means. What I didn't know what that I was arriving in the city on what is probably the busiest weekend of the year. 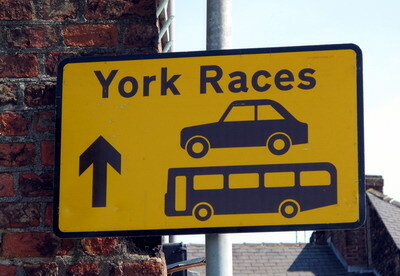 The weekend of the York Racecourse Spring Meeting when it seemed that a goodly percentage of the English population was planning on partying and my lack of planning was going to cost me a bit is a couple of ways. Since I had no reservations anywhere, one direction was as good as another when I left the railroad station. I trundled along for a while with my luggage/backpack/daypack all assembled into a single piece and eventually, and entirely at random, I came across a sign "tourist information" and considered myself lucky. Of course when I got across the street and actually got inside it became apparent that something was going on. As it turned out they were in the process of closing down the office for relocation and had no telephones so they couldn't help me in finding a place to stay. At least they did have a street map of the central city so that I might at least know where I was wandering -- even if I didn't have a destination. Luckily the street I was on and those connecting had a number of small hotels which were conversions from Edwardian (I think it was that era anyway) houses -- glorified mega-B&Bs for the most part. Every one I came across had the same "No Vacancy" sign in the window so I wandered on, eventually coming to Bootham Street and making I right turn I got lucky and found a signless window in one of the larger hotels. Indeed, they did have a room for me but the catch was that it was for one night only. Figuring that one night's sleep in a bed rather than on a park bench was a step in the right direction I took the room, made my way to it (the room was way in the back in what I'm assuming was a stable or something like it 150 years ago, and made myself at home. My rest didn't last long since I was anxious to get out and see some sights before it got too late so I sorted out my camera from the rest of my junk and headed out the door in the direction of the York Minster -- the one building that can be seen from anywhere in the city. I wandered randomly with no destination in mind but the sights were interesting virtually anywhere in the old walled portion of the city so an actual destination didn't really enter into consideration. On the way around I ran across the railroad station again and decided that pre-purchasing a ticket now for the departure couldn't hurt (more on that later) so I took care of that bit of business and sucked down some coffee while I was at it and wandered on. Everywhere I went I found a surplus of charming old buildings, churches, ruined walls, and tourists. Oh the tourists! The numbers were amazing and their increase showed no sign of slacking. But who was I to comment — being a tourist myself — and one less prepared than most. As an example of my lack of preparation – I had wandered away from my room without my city map and with only a vague recollection about the exact name of my hotel. And what was that street? Luckily there was still that prominent landmark of the York Minster rising above the city and a recollection of how it appeared from my hotel when I left so I was eventually I made my way back down the correct street and to a convenient Indian restaurant for a bit of Rogan Josh to stave off starvation. Thus strengthened I picked up my map, marked the street and hotel, and went out to walk on the city walls, the evening being clear and beautiful and I having nothing else on for the evening. ↑ ↓ I was up at an insanely early hour. I can't say the exact time but it was early enough that I was on the street and taking a picture of a hot air balloon floating over the city at 7:02AM and a couple of hours before I might grab my breakfast. That meant even more wandering and as I wandered I kept watching for a possible room for the night. The young woman at the desk the previous day had said she would be on the lookout for a room for me but that didn't relieve me of my responsibility. My pre-breakfast wanderings took me back past the train station and I checked the ticket counter but it was still closed. The reason for checking was that in my rush the previous day I had bought the wrong ticket -- a non-refundable non-exchangable ticket which would do me no good at all being, as it was, for the wrong day. Perhaps I was more tired than I had thought. I had given the inexpensive useless (to me at least) ticket away the previous evening and needed to get the correct one. Down past the train station a mile or so was the NRM - the National Railway Museum -- which I wanted to visit but if it was too early for a ticket desk to be open it was obviously too early for a museum. The walk-by was more to ensure that I knew the location and to find out the opening time. Eventually I headed back in the direction of the hotel and, as luck would have it, the railway ticket office had just opened. The new ticket was far more expensive than my original useless one and came with another big problem -- the railway schedule on Sunday is much more sparse than on other days and, given the hour which I needed to get to the Manchester airport for checkin I would have to take the very first train of the day at the obscene hour of 6:30AM. Oh well, if I can't find a hotel for tonight perhaps I could just find a convenient bench or bush and sleep at the station? As it turned out there was no need for such extremes. After breakfast the desk staff at the Minster Hotel did some more checking and found me a room for the night. The only real problem was that the room was virtually at the opposite side of the city (by which I mean the old, inside-the-walls portion). This forced me into a compromise with my "walk the city" pledge and I broke down and took a cab from my old lodgings to my new lodgings when the time came. The new hotel was similar to virtually every other one I had seen -- a huge Edwardian(?) house refitted from personal to commercial use. Every space from the attic to the stable gets taken up in these conversions and I think that I was in the old carriage house. No problem though -- it was a room with a bed and a bath and not ruinously expensive and I would not have rejected it even at twice the price. The rest of the day went pretty much as the beginning did -- more wandering and looking. I eventually did get back to the Railway Museum when they opened, finishing up there at a bit past 2PM. The museum is something of a mixed bag. There are some truly impressive displays and some exotic equipment but I had little luck whipping up a lot of enthusiasm. Perhaps it was just that I was tired from the earlier wanderings which took me to the Viking museum at Jarvik which gives another view of the life in ancient post-Roman pre-Norman York. I also wandered the famed Shambles [my impression bottom-center] which is a tangled warren of ancient shops in the oldest part of the city. This probably wasn't the best day for this since the tourist hordes were especially thick. But for picturesque, you'd be hard-pressed to beat the Shambles. There were variety of buskers plying their trade in the old part of the city amid the tourist hordes and, for the most part, they were a mixed bag but I have to commend the group named Blackbeard's Tea Party. They are talented and entertaining and I was frankly quite surprised to find such a group performing on the street. It is a bit like finding out that they guy playing for tips on the street corner is Jeff Beck. This group has at least one CD out although it seems to be virtually impossible to find in the US. Luckily one can download tracks at amazon.com. I'd suggest track 2: 'Cliffs of Moher / Slagthro's Death Roundabout' as a good introduction. The goups style is hard to pin down -- it is definitely celtic but with rock/folk influences. The group has a website and you can buy their CD there as I did. If you are having a ceilidh you really ought to consider hiring these folks before they become too famous for busking and parties! I continued wandering and wandering until I could wander no more so I headed back to the hotel to rest my feet at last. I got my shoes off and flopped onto the bed in a daze and thought for a long time about what I had seen on my trip but especially during my short time in York. Perhaps it was some sort of fever coming on since I did come down with a truly horrendous cold shortly thereafter but I actually thought to write down some of my thoughts. ■ One observation was inescapable -- a rather large percentage of the young women in York are very attractive. That got me wondering if this was some sort of hangover from the Scandanavian Viking genes? Or was my observation influenced by the warmth of the day which seemed to have brough a lot of skin into view? 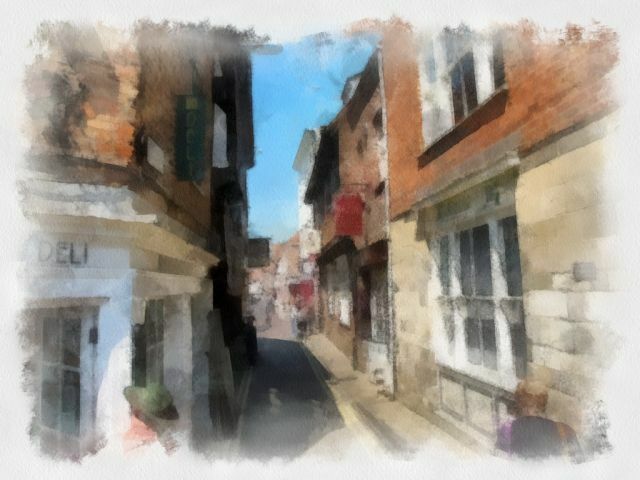 ■ Another was that the variety of market stalls and shops in the Shambles is amazingly large for such a small area and the tourist density on a warm clear beautiful weekend of the York races approaches infinity. ■ I used to collect clocks and know a bit about what makes a good one. The Railway Museum displayed a beautiful 1862 clock which originally cost £17. What sort of fortune might it be worth today? ■ And, last but not least, based on my experience so far, the English seem nearly incapable of making a good sandwich for some reason. I will forgive this seeming lack based on the number of good curries I've had. Panic! A bit after 4PM I popped up from my bed after realizing that, of all the things I wanted to do and see in my short time in York, I had entirely missed going to the Minster. This would certainly not do. I quickly gathered my necessities and rushed out. Deciding that walking the miles to the center of the city would cost too much time I grabbed the bus and headed out. 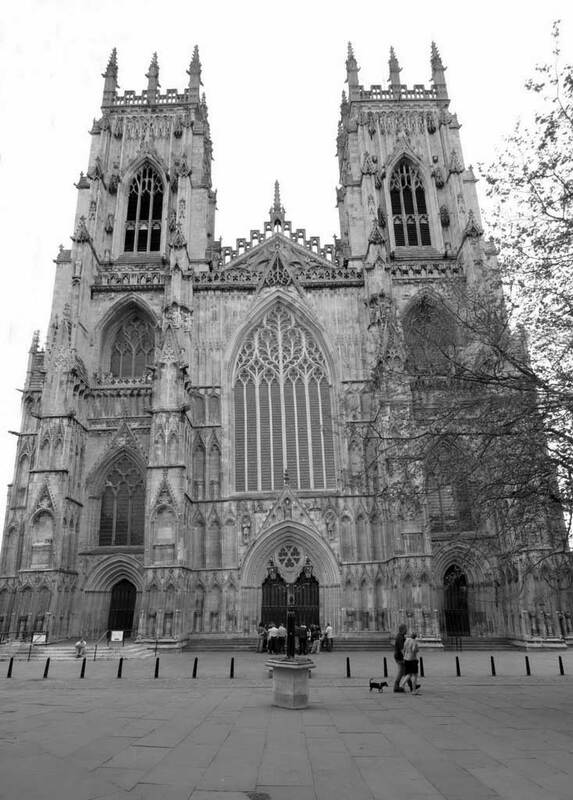 I managed to get to the Minster before the tourists would be herded out. In fact, since there was to be a musical performance by the Black Dyke Band that evening which was to be broadcast by York Hospital Radio there was a major amount of activity while preparations were made. I was in the Minster before the evensong service and, although I didn't attend, I did listen while wandering the beautiful old structure quietly snapping pictures. As much as I wanted to, I just couldn't bring myself to wait for the band's performance and left a little before the performance was to begin and wandered back toward the hotel. Since there hadn't been time for a meal I stopped at an 'Indian' restaurant for a quick curry. I hit the restaurant at a rather dead time and this lead me to a discussion with the head waiter while the kitchen worked on my Rogan Josh. I learned that virtually no Indians are in the 'Indian' restaurant trade in the UK with most of the establishments actually being Bangladeshi or Pakistani. Either way is is fine with me. Having a variety of restaurants serving food from the subcontinent was a refreshing change for me. I did have a bit of confusion about what is and what isn't Rogan Josh. To me the dish is a spicy lamb or mutton stew with little more than meat and onions in a yoghurt-based sauce. In the UK it seems to have picked up a few other ingredients including tomatoes which definitely changes the look and taste. Not worse, you understand, but certainly very different from what I first experienced in Pakistan. I eventually wandered off toward the hotel satiated by curry and Kingfisher Lager to prepare for tomorrow which was definitely going to start off stressfully. ↑ ↓ Mindful of the extremely early Sunday train from York to Manchester I kept waking and checking the time. Finally, around 5:15 I gave in and got out of bed, washed up a bit, and packed the final few items into my bag. I took the time to unpack my old rain poncho which had proven itself so prone to soaking and left it, rolled neatly, in the room's trash bin. No need to carry any extra weight back to the US. I managed to rouse the night porter at the hotel desk so that I could check out and wheedled a bit to see if he could grab me a couple of pieces of fruit from the hotel kitchen in lieu of the breakfast I wouldn't be consuming. Thus my breakfast consisted of a couple of apples consumed at the curb while waiting for the cab which the porter had called for me. The cab got me to the train station before 6:15 which was plenty of time for me to get a another €20 from the cash machine (the cab fare pretty well wiped out my last bit of ready cash) and to grab a cup of coffee before the ever-efficient rail service whisked me off to Manchester. The period between getting on the train and getting on the plane was pretty much of a blur. Security and boarding procedures were pretty strenuous and for the first time ever I had to go through the whole patdown and shoe inspection schtick. I don't know if I was looking especially terroristic (I was feeling pretty terrible anyway) but the powers-that-be chose me for a thorough going over anyway before I could board. I kept waiting to see if anyone would open my hermetically-sealed bag of dirty laundry but apparently nobody did -- it would surely have set off some sort of a biological warfare alarm if they had. Oh well, that's what they get for not having a laundrette anywhere I could find. The flight to JFK was nothing short of horrendous. I was in a bad mood to start out with but being caged up with children, alternately squalling and hyperactive, for many hours in a non-reclining seat too close to the aft restrooms would have put me in one even if I had not started out that way. Even earplugs and a Xanax washed down with Heinekin (yes I did) weren't enough to get me more than an hour of rest. And then there is JFK. It is really difficult to imagine many worse places than JFK overseas arrivals. A Turkish prison might out-do them for sheer squalor but certainly not by much. In the London underground the recorded warning is "Mind the gap" delivered in a polite tone. At JFK arrivals, if they cared enough to bother, the recording surely would have been "Mind the rats" delivered in a surly snarl. It is hard to imagine how any public facility could be allowed to get into the filthy nasty state I saw. Paint cannot turn that shade in less than a decade. Had they even bothered to sweep up every week or so it might have helped. On top of that the queues to clear customs were endless and slow with the appearance that the employees were in the middle of a perpetual coffee break which they were unwilling to end. Making Excuses: The story of this day of the trip comes to an abrupt end and needs to be rewritten more than a bit and I will make an effort to do so. It was posted nearly a year after the actual trip and my recollections were a bit fuzzy and the extremely detailed contemporaneous notes turned out to be rather sketchy upon inspection. This last day was a pure misery as I was coming down with a world-class cold which hung on for more than a week after my return. As it turns out, while I was trying to get this story pieced together and posted I was also making plans for a similar trip to Scotland. 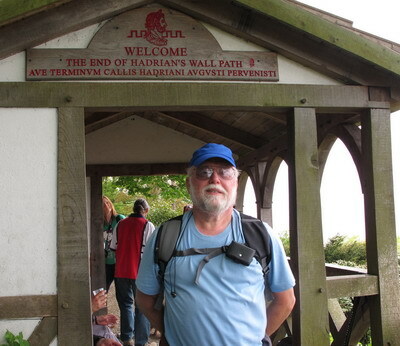 This time I will be following the Great Glen Way much as I followed the Hadrian's Wall Path in 2010. With luck and some better better planning on my part maybe this one will work out smoothly, my notes and pictures will be better and I will do the writeup and get it posted on the site in a more timely manner. Face it, I could hardly be slower the second time around.